I am definitely excited for this giveaway! :) I was actually supposed to do it last September for my birthday giveaway but failed to do so. I am definitely happy that this giveaway was able to push through this month. I hope this would keep my blog busy while I read through my cases and codals for my final examinations. I am pretty sure that you have all heard of Asianvogue Shop. I am a huge fan of theirs! They're no other than the most popular local shoe store in the net! They carry in their shop endless pairs of shoes, which are not only to-die-for but also affordable and one of a kind. I am pretty sure you cannot get those gorgeous AV shoes straight from a rack of a mall. They also sell the cutest pre-order bags and apparels. You should check out their page and see it for yourselves! 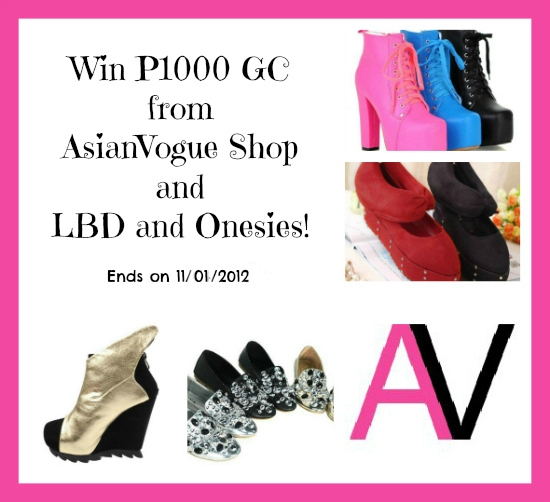 One lucky winner will receive a 1000 PHP GC from Asianvogue Shop. The giveaway will run from October 7 to November 1 only. The winner will be chosen through random.org. The winner will be announced and contacted via email on November 3. The gift certificate can be used to purchase any pre-order product from Asianvogue Shop. Location : City of San Fernando Pamp. San Pedro, Laguna but i also stay in a dorm at Sampaloc, Manila! oh my god! thabk you for this! I cant believe that i won! thank you Ms. Mish and AsianVogue!